July 12, 2017 (Las Vegas, NV) – Players can start to see the light at the end of the tunnel with the completion of Day 2A/B of the 2017 World Series of Poker Main Event on Tuesday night. There were 2,219 players that came back to the Rio for their respective Day 2’s, but there were only 1,023 that remained at the end of the night’s five levels of play. As the day grew later, Mickey Craft began to separate himself from the field. He was the first player to crack the 500,000 chip-mark and held the chip lead for most of the day. He ended the day with 608,100, good for second in chips just behind Lawrence Bayley and his 618,000. Craft picked up most of his chips in a three-way all in with his pocket aces holding up against pocket kings and pocket fours. He then Despite his strong finish, he got off to a rough start to the day. This is Craft’s first Main Event, but it’s certainly not the first time finding success in a WSOP event. Earlier in the summer, he final tabled the $3,000 Six-Max Limit Hold’em event, finishing third for $69,789. He picked up a nice score for his final table, but that didn’t affect whether or not he was playing the Main Event. Joining Bayley and Craft at the top of the counts are Segio Castelluccio (548,500), Michael Sklenicka (540,600) and Joseph Conor (511,100). Grayson Ramage (471,000) and Jared Hamby (455,000) are also in the top 10 chip counts. Another player who had a solid day at the office was Doug Polk. Polk spent the majority of the early part of the day on the feature table, which was streamed on both ESPN and PokerGO, sitting on the direct left of Sam Grafton. Despite two top pros sitting next to one another, they didn’t seem to clash much at all and they both finished the day very healthy in chips. Polk finished the day with 287,500, which is obviously enough of a reason to have a smile on his face, but throughout the day, his table was generally one of the louder in the room with lots of laughing going on between him and Grafton. Grafton finished the day with 314,900 which gives both players very workable stacks heading to Day 3. Polk, however, has been making a concerted effort to put out media on his YouTube channel away from the table. His time spent in front of a camera earned him some time on ESPN yesterday on his off day between Day 1 and 2. “For sure, it’s becoming something that I’m a little bit more natural at,” said Polk about commentating on camera. Despite his comfort in front of the lights, Polk had a moment where he realized the gravity of the situation of becoming an actual ESPN anchor. 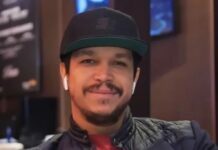 Other notables who survived the day with healthy chip stacks include Thomas Muehloecker, Marvin Rettenmaier, Charlie Carrel, Tex Barch, Randy Lew, Jonathan LIttle, Bryan Piccioli, Ryan D’Angelo, Ismael Bojang, Mike Matusow, Chris Hunichen, Ankush Mandavia, Jake Bazeley and Matt Berkey. 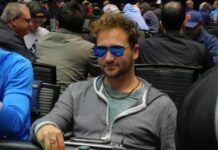 Jessica Dawley, Owen Crowe, Kevin Saul, Phil Laak, Brian Yoon, Jennifer Shahade, Martin Jacobson, Koray Aldemir, Patrick Leonard and Brandon Steven were among the notable eliminations from the day. There won’t be a repeat champion this year, as Qui Nguyen hit the rail early in the day when his top pair couldn’t hold off middle pair and a flush draw against James Akenhead. Day 2C will get underway on Wednesday at noon. PokerGo will stream the day’s action from 12:30 p.m. to 5:30 p.m. on a 30-minute delay. The coverage will switch to ESPN from 5:00 p.m. to 7:00 p.m. There are 3,300 players returning for Day 2C and the survivors of Wednesday’s action will combine with today’s 1,023 players that survived for Day 3 on Thursday.